Lynn Agnew grew up outside Philadelphia and moved to Washington State after she graduated from Middlebury College. She worked for many years in the fields of art and education, including at Voyager Montessori, the Island School and Hyla Middle School. She has also written curriculum for the Washington State Arts Commission. 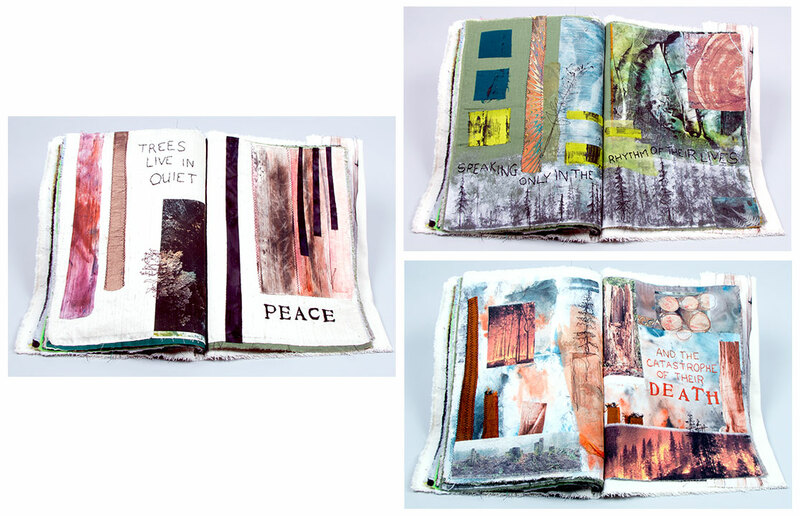 Lynn is an active artist and had a jewelry-making business for years, and now makes artist’s books..
Kingston, Washington: Lone Pine Press, 2016. Edition of 2. 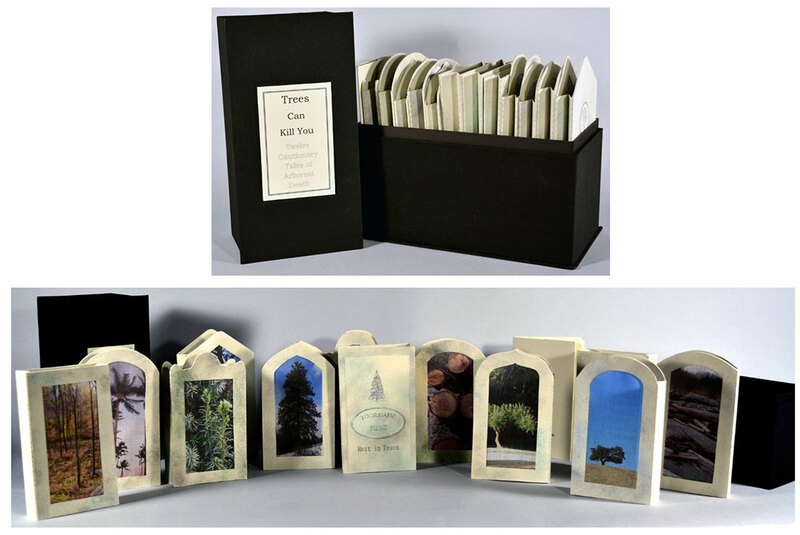 8 x 4 x 7" box housing 12 tunnel books. Inkjet printed on Rives BFK grey paper. Embellished with Fabrico stamp-pad ink and colored pencil. Bookman Old Style typeface. Tree images printed on cotton organdy. Box constructed of binder's board and book cloth. Signed and numbered by the artist. Lynn Agnew: "This book is a morbidly playful response to a near-death experience that occurred at the close of a backpacking trip with my husband. On a clear, still, afternoon … a giant Douglas fir, at least seven feet in diameter, fell across our trail less than thirty feet in front of us. Ever since that moment, I have regarded trees not only with awe and wonder, but also with a healthy dose of suspicion. ... Do they really have a secret plan to do us in? 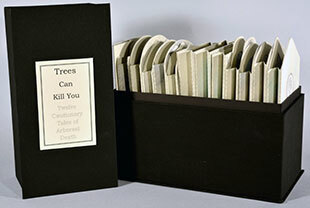 "The small headstone 'chapters' of this book each tell the imagined sad story of the victim of a tree. The story can be read by looking through the 'veil' of the peaceful images of wood, trees, and logs in a 'before' view of the death ...."
Kingston, Washington: Lynn Agnew, 2017. One-of-a-Kind. 11 x 13"; 22 pages. Fabric collages embellished with hand and machine sewing. Materials include cotton, silk, and canvas. Image techniques include paint, dye, stitching, transfer, and print. Collages assembled using machine stitching and heat-sensitive adhesive. Text embroidered by hand. Stick binding with wrap-around cover of canvas with wooden button and twine closure. Lynn Agnew: "I created this book as a reminder to the reader that trees are worthy living beings and worth protecting ... but ... they cannot speak for themselves. 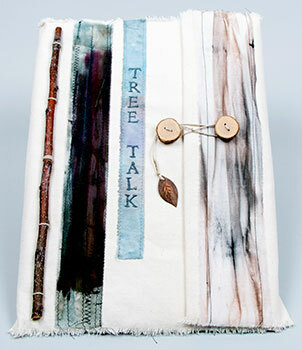 'Tree Talk' is a collection of fabric collages done to elicit the feeling of being in the woods at various seasons of the year. For me, no matter the time of year, being in the forest is a quiet reminder of how vital holding on to stillness in our lives can be. When I pause to listen to the quiet in the forest, surrounded by trees with only bird calls, or the gentle rustling of foliage, falling snow, or evening shadows, I find a calm that is difficult for me to replicate elsewhere in my life, and in the quiet, I find Joy and peace. "However, the Pacific Northwest, as in many other places in the world, the destruction of wilderness is an ever-present threat. Losing forests lands is a tragedy we can sometimes avoid, but to takes the vigilance of all concerned citizens to protect the places that offer so much to enrich our lives and spirits."